Speaking Ubass!? – ubass focused music releases by Magnus Sjoquist – Play UBass! So far I have two official releases from my first Speaking Ubass album. You can also find these two songs on most streaming services. Just search away! More releases are on the way! Since a while back I’m working on a recording project that hopefully will end up being a CD! In this blog post I made it public. On this page I will let you know how my project progresses and maybe even let you listen to some ”snippets” of the recordings! As you can read in my ‘PM‘ I decided to make my first CD featuring the UBass playing music in different settings. I’m doing this for two reasons. 1. I want to show just how much of a ‘chameleon’ the UBass can be – how it can ‘blend’ in diverse settings! 2. I really enjoy playing a lot of styles and wanted to showcase this AND also feature some of my friends. As to date I have recorded two different ”ensembles”. Two different trios; piano, drums and ubass and a guitar, ubass/vocals duo. I’m in the middle of rehearsing another duo/trio with guitar, drums, ubass and I’m also making plans to record with two more guitar/ubass duos! Stay tuned for more info soon here on this page! I have a couple of sessions lined up! I will record some country/bluegrass music with a guitarist (and hopefully drummer on one of two songs). There is also some more jazz based music featuring another guitarist in the works! More sessions are on the way too! Check out my blog or Facebook page for how the project progresses! One more song featuring a ubass+vocal intro is recorded! This is a classic evergreen, can’t wait to share it with you! First song released! Check out my bandcamp page! Second song released! Check out my bandcamp page! Third song released! Check out my bandcamp page! Pingback: [Rehearsal Report] Jammin’ with my Kala UBass | 23 Blues: “Long time no PLAY” « Play UBass! Pingback: New info on my Speaking UBass CD project page! | Play UBass! Magnus, did you mean to say Spring and Autumn 2013? Susan: I haven’t been working as much as I planned to want to since ‘Phase 1’. My initial goal was to put the cd out this year. But as it turnes out I will have to work a bit more to get it done. The hardest part is to find time for the different sessions to take place. I have made recordings with a couple of the featured guests so far but I have a few more to do. Hopefully I will be able to record two or maybe three different settings before the holidays. I’ll try to post my progress a bit more frequent from now on! Stay tuned! Hi Susan! Three songs have now been released from my first ”Speaking UBass” album! 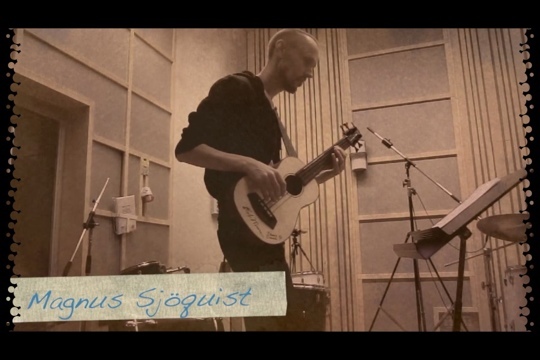 Magnus we are really looking forward to hearing your U-BASS CD, what’s the current update? Hi! Well, I have just finished a cd with Swedish children song in a new jazzy way. It has taken a lot of my time besides my day job as a music teacher and ICT-pedagogy! Now is the time to focus on the Solo CD!